The holiday weekend provided a little extra time for some outdoor fun. 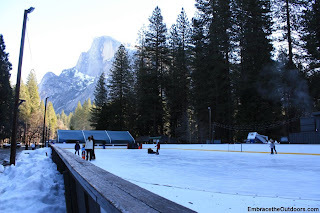 A few months ago we made plans to head to Yosemite and booked one night at the Yosemite Lodge. This was not really going to be a trip to be really active but more of a chance to just get outdoors and enjoy Yosemite’s winter beauty. We left early Saturday morning from the bay area and headed in via highway 140. 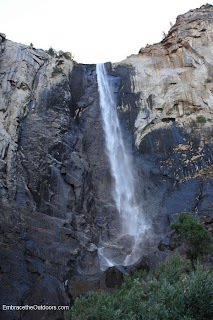 We arrived just before 10am and headed straight to Bridalveil Falls. This is where we saw something we have never had the privilege of seeing before at Yosemite-no crowds! The parking lot for the fall had only one other car parked in it. We visit Yosemite a couple times each year, always during the summer months but haven’t been during winter since childhood. So seeing the parking lot empty was weird to say the least. We scurried up the trail to the base of the fall and took a few pictures. There was not a lot of snow as it had been several weeks since snow hit the valley, but the snow that was there made for a very different experience than what we are used to. We jumped back in the car and headed further into the valley. We pulled off the road to take some pictures of El Capitan. This is something we have never done before because normally there is a long line of cars parked here taking pictures, and we had never wanted to deal with the hassle. On this day there were only three cars pulled off the road in this area. We proceeded to Curry Village where amazement would hit again. The parking lot was empty. Definitely had never seen an almost empty parking lot at Curry Village. Usually we have to drive to the far back corners of the lot to find a spot, but this time we were first row. We checked out the ice skating rink where there were several families having a good time. Happy Isles Trailhead was next on the list. We decided to walk to the footbridge where we got some photos of Vernal Falls. There were several other people making the walk, but nothing compared to the numbers you would see during the summer. After some photos and hiking back, hunger was really setting in. We went back to Curry Village and had a pizza for lunch. 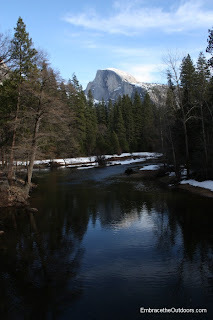 After lunch we made our way to Yosemite Village with a quick stop at Sentinel Bridge for some great photos of Half Dome. 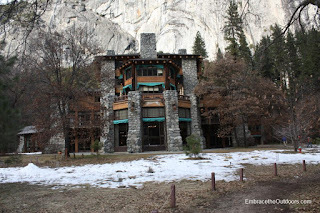 Once in Yosemite Village we made our usual stop at the Ansel Adams Gallery and made the short walk to the Ahwahnee Hotel. 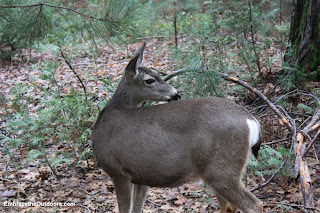 On the way there we came across a deer feeding just off the walking path and stopped to admire and take pictures. After the Ahwahnee we noticed we had some time to spare before checking into the lodge so we walked to the base of Lower Yosemite Falls. This trail did have more foot traffic but not nearly as much as summer time. There was noticeably more water flow at the lower falls but not much at the upper falls. It was time to check into Yosemite Lodge. Once settled into our room we had dinner at the nearby food court and then headed to the Ranger Talk that night on one of our favorite topics-BEARS! It proved to be a great one hour talk. Time for bed, although it proved to be a rough night. There was some periodic noise in our room, we think from the heater but can’t be sure. Walls are thin and room wasn’t as clean as we had hoped either. Nevertheless we got some much needed sleep and were up early the next day. 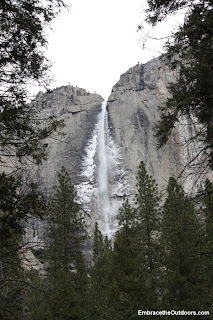 We stopped at the food court again and had breakfast, and took a few more pictures of Lower Yosemite Falls since it was quite a different view in the early morning. We made our way out of the park with a last minute stop at Cascade Falls for a few more pictures. 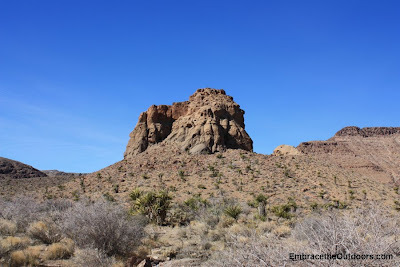 On the second day of our trip in Southern California we headed to Mojave National Preserve. We had picked up information about the park the day before at the Oasis Visitor Center in Joshua Tree National Park. We knew there wouldn't be any food in the the preserve so we made a stop for sandwiches before heading out on the road. After about a two hour drive we entered the park through Essex Road and stopped at the Hole in the Wall Information Center. This center also has a small bookstore, picnic area and nearby campground. The trailhead for the Rings Loop Trail is close by as well. We perused the information center, then made our way to the trail. 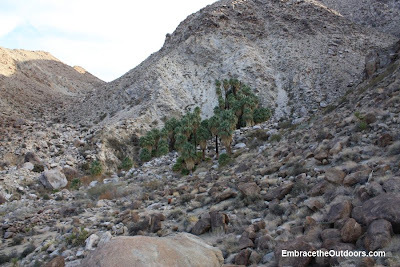 The Rings Loop Trail is a 1.5 mile loop that takes you near the Hole in the Wall campground and past many yuccas. Most of the trail is fairly flat and easy. You pass by many rocks and cliffs with holes and hollows, for which the information center is named for. 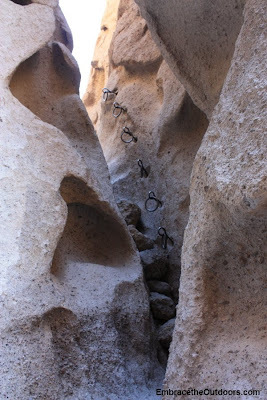 Near the end of the loop you reach a very short strenuous section of the trail where you have to ascend through the canyon using metal rings that are mounted in the rock. Although we've used chains on a trail before, this was the first time we had to use rings and it proved to be a lot of fun. Before we knew it we were back at the informatinon center. Next stop was the Providence State Recreation Area, which is still within the boundaries of the National Preserve. It's about a 25 minute drive from the information center to this area, which has a tour center, campground and caverns. There are three short hiking trails within the state area, which seem more like nature walks. There are also ranger guided tours of Mitchell Caverns on most days of the year and we were lucky enough to be able to go on one of these. Cost of the tour is $6 per person. 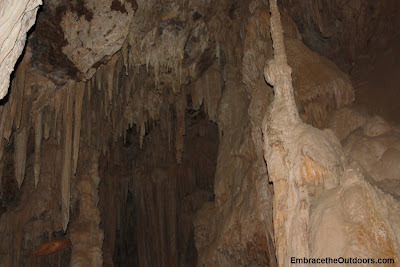 The tour is about a 1.5 mile walk that takes you to the entrance of and through the limestone caves. During the 90 minute tour we learned about stalactites, stalagmites and numerous other cavern formations. Sometimes bats and other wildlife can be seen on these tours but we weren't so lucky. The tour completed our day at Mojave National Preserve and we headed back home. There are a few other information centers within Mojave National Preserve and three small campgrounds, but not many hiking opportunties. We decided to start the New Year off with a short roadtrip to Southern California. On our first day we headed to Joshua Tree National Park. 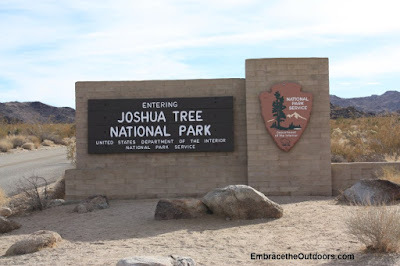 This was our first visit ever to the park and our first stop was the Visitor Center in the town of Joshua Tree. After getting some info we went right across the street to Subway to grab sandwiches that we could have later for lunch since there is no food available inside the park. 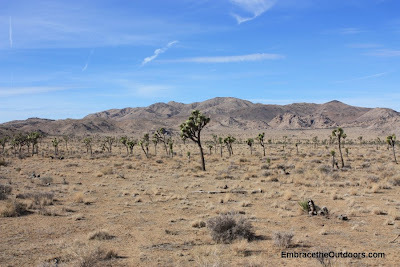 We began our drive into the park from the west entrance and soon could see the Joshua Trees that the park is named for. Our first stop in the park was the short hike or nature walk to Barker Dam. It's a loop about a mile in distance that takes you past the dam. There was very little water there. We continued on into the park and made a quick stop at Cap Rock, which was not impressive. Continuing on we went to Keys View. Now this was a bit more impressive. Sweeping views of Palm Springs, Mount San Jacinto and the Coachella Valley all the way to the Salton Sea and the Sonoran Desert Mountains in Mexico on a clear day. 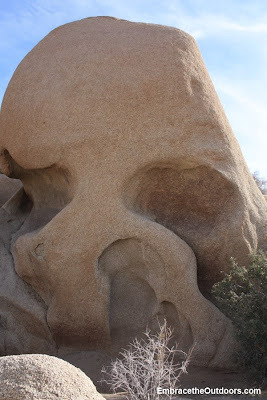 Next stop was Skull Rock which is basically a big bock that kinda looks like a skull. It's right off the road and you don't need to hike to it but you do have to climb over a few rocks. This was a busy place with lots of families stopped here and the kids seemed to love scrambling all over the surrounding rocks. After some photos we continued our drive through the park. Next was Arch Rock. To get to Arch Rock you drive into the White Tank campground and head towards site #9. Across from the site there is parking for maybe four or five cars. The trailhead is easily seen from there. From the trailhead to Arch Rock its a 0.3 mile nature walk. You can climb up some rocks and actually stand in the arch for some photos. By this time it was mid day so we took a break to eat our lunch. Afterwards we headed out through the north entrance of the park and stopped at the Oasis Visitor center in the town of Twentynine Palms. Here we purchased our usual souvenier magnet for the fridge. 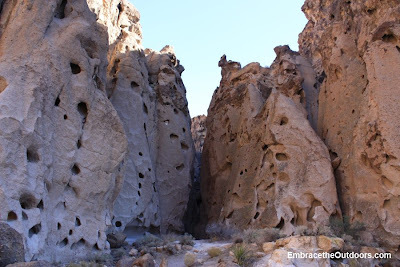 We also grabbed some information about Mojave National Preserve, but more on that in our next post. We hopped on highway 62 heading west, made a left on Canyons Road and followed it all the way until it deadends at the trailhead for the 49 Palms Oasis trail. This hike totals three miles and is an out and back and according to the brochure moderately strenuous. The hike starts with a gradual climb over the mountain, after which you have a long descent into a small valley. Halfway down the descent you get your first glympse of the palm trees that make up the oasis. The oasis is a remarkable contradiction to the surrounding dry, rocky desert terrain. After spending some time enjoying the palm trees and the sounds of wildlife we headed back on the trail. 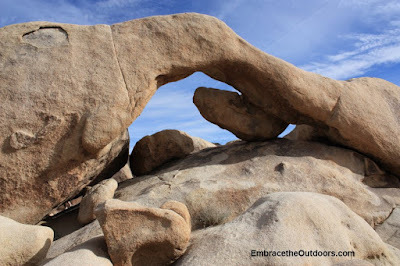 The hike proved to be moderate, not strenuous at all, and a must do at Joshua Tree National Park. There is another Visitor Center for the park at the south entrance, Cottonwood Visitor Center. 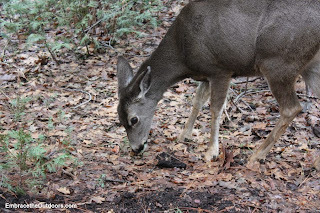 There are backpacking trails and nine small campgrounds within the park.